More than 25% of harvested cereals are contaminated by different types of mycotoxins (Source: FAO). The main damage caused is a weakening of the immune system by polycontamination, which leads to lower zootechnical performance. All animal species are sensitive to mycotoxins, even at low levels. The key to combatting mycotoxins in feed is to use a wide adsorbent spectrum, given the constantly evolving forms of mycotoxin contamination . A good binder must also be effective against mycotoxins such as deoxynivalenol and fumonisins, which are difficult to bind due to their size and shape. The MMi.S formula provides wide-spectrum adsorption. Its innovative microgranulated format facilitates mixing into feed and handling on the farm. Olmix toxinbinder was tested in TNO gastric model (Holland) and proved to be able to protect against wide spectrum of toxins including fusariotoxins*. MMi.S has been developed in granules for easy use directly on the farm. Its non-dusty form also enables feed manufacturers to achieve more homogenous feed mixes. 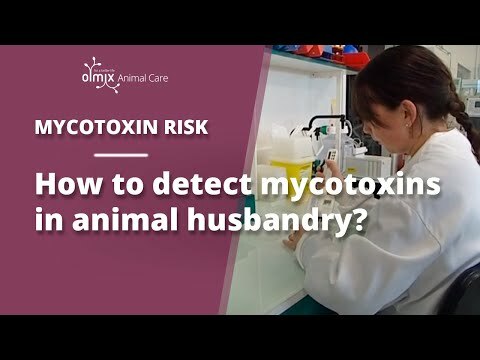 Mycotoxins: how to detect them. The first poster presents a study demonstrating the efficacy of an algo-clay complex on decreasing mycotoxin liver toxicity on broilers. The second poster analyses the occurrence of field and storage mycotoxins in Poland from years 2013-2016. The company showed its algae-based natural solutions at the Booth AE-38 and hosted a technical seminar on mycotoxin risk management.